Escape the soaring mercury to be amongst Magpies and breath-taking views of Mt. Kanchenjunga at the beautiful Magpie Chestnut Retreat. 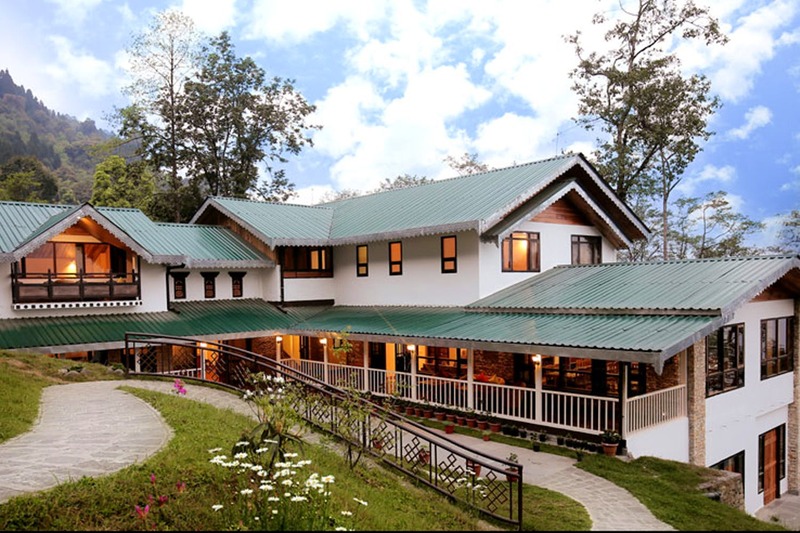 The Magpie Chestnut Retreat is a picturesque and contemporary property, nestled on the mountain tops of Pelling. Each hillside duplex cottage overlooks a range of foothills with gorgeous views of Mt. Kanchenjunga in the distance. The resort offers an unobstructed view of the majestic Kanchenjunga range. Surrounded by a thick canopy of chestnut trees, with Magpies visiting your balcony, this place provides the serenity of a cozy nook that one longs for in the mountains. Recuperate from a full day of sightseeing in the comfort of your luxurious room or take advantage of the hotel's recreational facilities, that includes a garden and play area. The rooms are well-maintained, spacious and furnished with all modern amenities. If you are travelling in a group, their luxury cottages are a great choice of accommodation. If you are a honeymooning couple go for their super dreamy attic rooms with a fireplace. Breakfast and WiFi is complimentary. The staff is very responsive and courteous offering 24-hour security, daily housekeeping, taxi and ticketing service. While there, you must visit the Pemayangtse Monstery, considered the premiere monastery of the state, meant only for ‘ta-sang lamas’ (pure monks). Hidden from the main road at a walking distance from the Pemayangtse Monastery is the Rabdentse Ruins. The mystic views of Kanchenjunga scanning across the deep valley from atop the ruins is mesmerising. Lounge beside one of the sacred lakes of Sikkim, Khecheopalri Lake, that remains hidden in the forests and is as serene as it can get. The tariff plans are flexible to suit different needs. While a deluxe room is chargeable at INR 7,000, the luxury cottage and attic duplex are available at INR 9,000 and INR 11,000 respectively. The room rates are negotiable during off season. Throw away your itinerary. Travel without any plans. Let the Magpie Chestnut Retreat pleasantly surprise you while you explore and discover the mystique of Pelling.